Small Parts are pieces of content that can be put together to quickly assemble a new and unique document. You can also think of Small Parts as templates that you can merge into a larger file. When to use Small Parts? For any document that has to be created often – such as invoices, quotes, reports etc. – Small Parts are an easy solution. You split up texts that you use often for document creation into smaller parts (i.e., Small Parts). 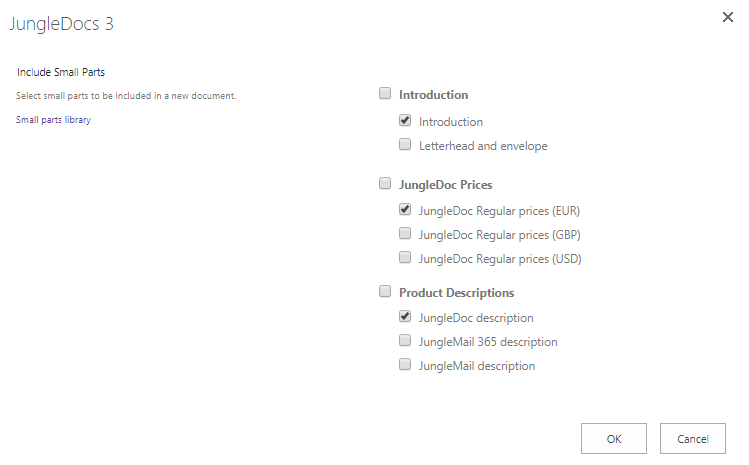 Once you have done that, you can use JungleDocs to select which of these parts you want to use to create a new and unique document. You do this by checking boxes. How to create a Small Parts library? 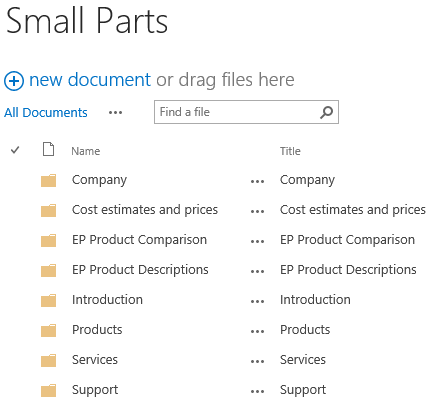 Small Parts are stored in the Small Parts library on your SharePoint. You create it in the same way you would create a normal document library. We recommend creating folders for different sets of Small Parts within the library. In this way, you will only see the relevant folders when running a JungleDocs rule. 1. To create a Small Parts library, first, create a new document library. 2. You are now going to add an App. Select Document Library to continue. 3. Name the library Small Parts. Inside this library, you can create folders that will hold your Small Parts. A good way to structure these folders is by documents they contain. 4. Add documents that contain the Small Parts that you want to use to the folders. 5. After you have done this you will link your Small Parts library to a certain JungleDocs rule (see next step of this tutorial). How to use Small Parts to create documents? There are three steps for creating documents with Small Parts. 1. Add Small Parts to a Small Parts library. Scroll up to the previous step for an explanation. 2. Add content controls to a document template. You can specify the Small Parts and their place in the final document by adding content controls to a document template. 2.1. Open your document template via a specific rule or open a new document. 2.2. 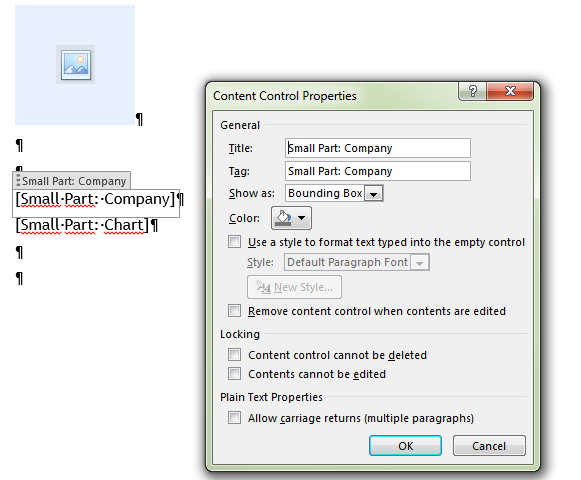 Add Rich Text content controls to the places you want to insert Small Parts. Use the tag: Small Part: Folder Name (for example, Small Part: Company). 3. Assign the document template to a JungleDocs rule. There are two ways to do this. #1 Modify existing template. To do this, navigate to the source list/library that you will use to create your documents and reports and launch JungleDocs. Now select the rule you want to edit the template for. Click on the drop-down menu arrow and click Edit template . This will prompt the template to open in Word. #2 Modify template when creating a new rule. Start by creating the rule. 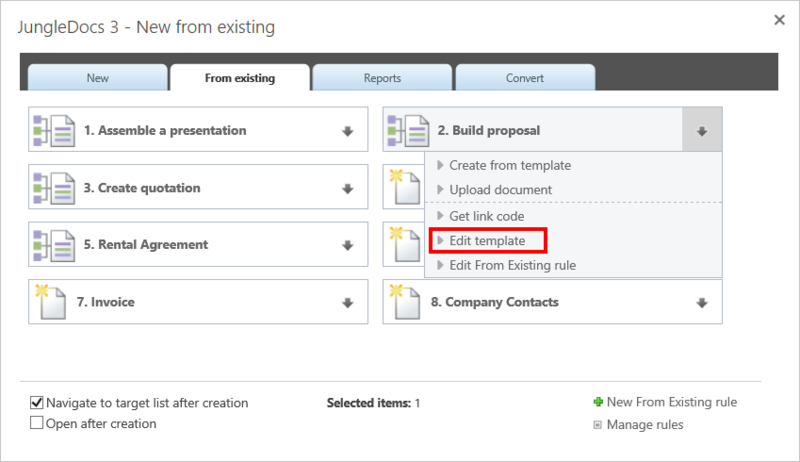 Then when configuring the rule you can select Custom template to upload a new template or select Edit template to edit the existing one. To exemplify what is discussed above, we will now move on to put the knowledge to use. In this example, we will create a quotation for a new client with Small Parts. 1. First, we will navigate to the SharePoint list where we store our client company data. 2. Now we will select the company for which we are going to create a quotation, e.g., Contoso. Then we open JungleDocs from the ribbon. 3. We can now select the JungleDocs rule we need. In this case, we have already configured the quotation rule to be used with Small Parts. 4. Once we click on the rule, JungleDocs will open an options menu where we can select the Small Parts we want to be included in the actual quotation. 5. After we finish walking through the steps, JungleDocs will create our document using the Small Parts we have selected.